On Saturday, my husband and I completed the Hot Chocolate 15k in Philadelphia. (That’s 9.3 miles.) The only other big run I’ve done was the Broad Street Run in 2013 (10 miles). Running Broad Street is sort of thing here in Philly if you are a runner but now after running the Hot Chocolate race, I realize why I wasn’t a fan. Broad Street is a flat course and there’s definitely something to be said for running through Philly and having people cheering for you the ENTIRE way but it’s 40,000 people and the crowds are just insane. I’m NOT a fan of crowds and it caused me a lot of stress. 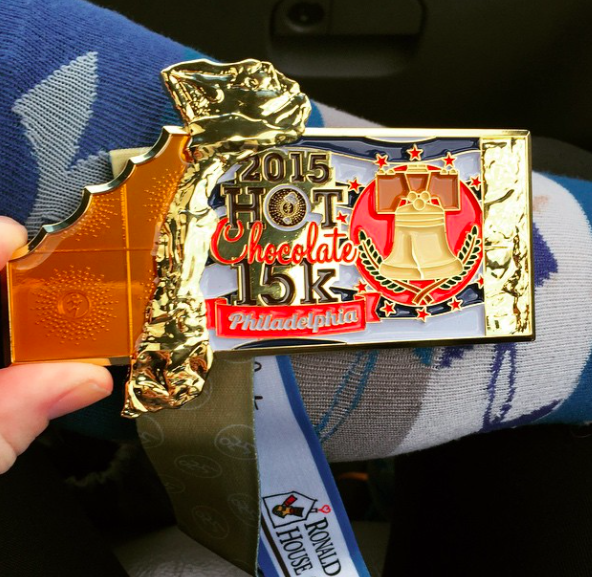 The Hot Chocolate 15k in Philadelphia had a little over 6000 people running it last weekend (6703, to be precise!). MUCH more manageable. It didn’t feel overwhelming at all and the vibe was great. 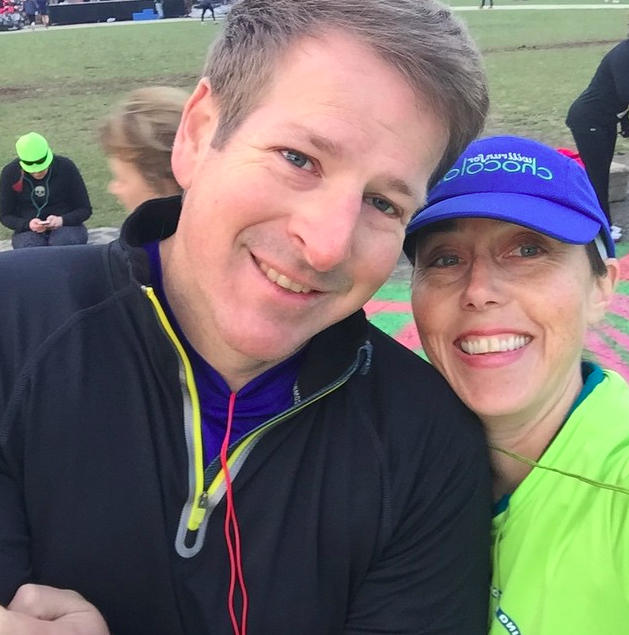 Also totally fun for me – I had my husband Jon running with me this time! Just knowing I would have company for the entire race made me so much more relaxed in the days leading up to the race and even while we ran. I’m not sure I’ll ever run a race again alone – knowing I would have him with me took a lot of the stress off. We were in it together. So we assigned to corral K, which was the third corral. I had submitted a proof of time from Broad Street but I am NOT fast. That was my only concern, why were we in the 3rd corral with the fast peeps?, but once we got lined up we realized that everyone behind us was just the people who hadn’t submitted times and there were folks around us that would be running our pace. There was definitely a mix of paces in many of the corrals which would be tough for a bigger race but seemed just fine for this one. The race started at 8:00 and let each corral go on a staggered 2 minute start which also really helped space out the crowd. I never once felt crowded while running. We were always running with people but I never felt like I was fighting for personal space like I did with Broad Street. 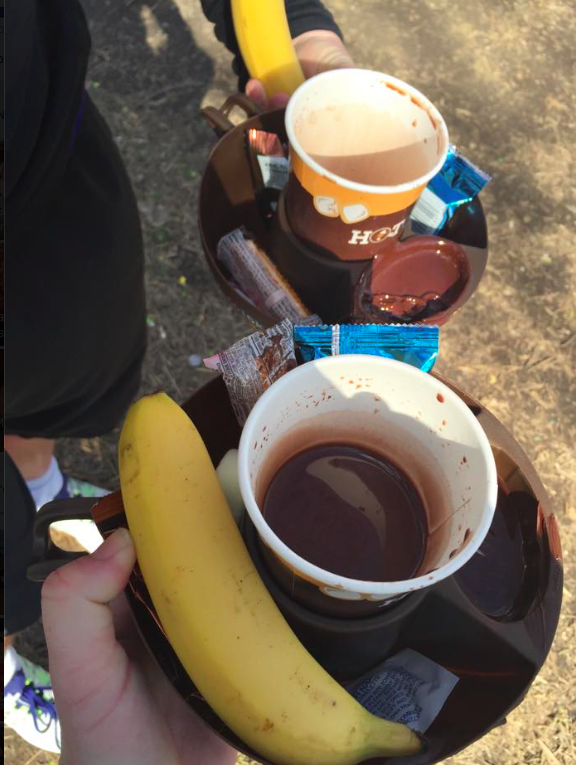 There were a couple of water stations along the way and apparently there were some chocolate-related stations too! I only saw a marshmallow station and I have to say, I was in no shape to eat a marshmallow when I saw it and was only after water but I did later see people stopping at a Tootsie roll station. It was a nice flat course that goes down the West side river drive of Philadelphia – great views of Boat House Row and the river and it was nice to watch the rowers and people enjoying the day as we ran. It was windy as heck with wind speeds at 25mph but we managed. Rounding close to the finish, around mile 9, there’s a hill. That kind of stunk but we pushed through it and the race finished in front of the Rocky Steps at the Philadelphia Art Museum! We got this cool bling! I signed up for this race because the timing was right and it was a good distance for hubby and I to aspire to run and not for the chocolate. I remember thinking how I would NOT want chocolate or to eat anything after running 9.3 miles – usually I just want to chug a bunch of water and to stretch! But I was so wrong. After each of us chugged a water, we lined up to get our “Finisher Mug,” which is a fondue mug filled with chocolate fondue, hot chocolate and goodies to dip in the fondue. I figured I would try a sip and be done. People. It was the BEST HOT CHOCOLATE I HAVE EVER HAD. Seriously, hubby and I couldn’t even speak words as we drank the hot chocolate. It was just so thick and good. Maybe our bodies were wanting the heat and the sugar after running in the wind? I dunno but I do know that I will be dreaming of that hot chocolate until we run it again next year. Oh and last, here’s a picture of our packet pick-up. There’s also some serious great swag with this race – we each got a Hot Chocolate fleece (which is really nice!) 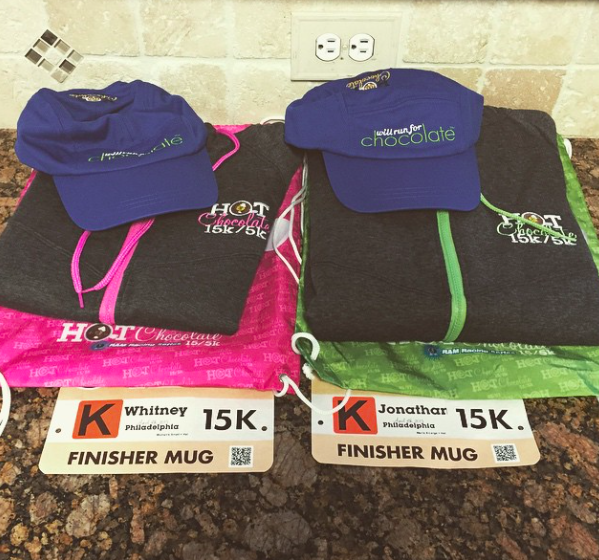 and hats that say “will run for chocolate,” that we got for being a part of a local group registration.